Using well known songs (with fresh arrangements), poetry and personal stories, the performers detail the journey from the end of an important relationship, through the stages of loss, highlighting all the ups and downs, funny and poignant moments in-between, towards self-acceptance and love. It is performed as a personal account but tells a very human story. It is a “‘feel good” story and tells the story of personal triumph. After all, what is life without promise, hopes and dreams, challenges, triumphs, mystery and drama? And of course … a whole lot of love! To a life well lived….. Fill your ‘Being’ and light the fire in your soul. 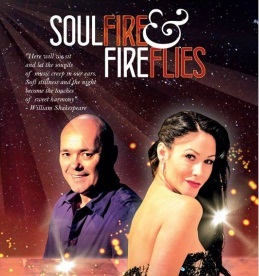 Soulfire and Fireflies has performances from at 20h00 from May 9 to 12 (except on May 11 when the group is performing at Sunflower Fund Event) with a further performance on May 13 at 14h00.